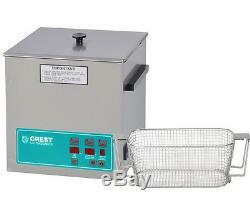 Crest Powersonic Digital Benchtop Ultrasonic Cleaner w/Heater, Timer, Degas, 1.5Gal, CP500D Brand New Item. Crest offers a wide variety of sizes and options in tabletop cleaners. Powersonic ultrasonic cleaners are available in 7 sizes from 1/2 gallon to 7 3/4 gallons in 3 different configurations. All Crest benchtop cleaners are supported by a a complete line of durable, quality built ultrasonic accessories. Crest offers you a high performance selection of stainless steel mesh and perforated baskets, beakers, auxiliary pans and beaker positioning covers. Glass polypropylene, and stainless steel beakers are also availeble. Wide range of specially blended cleaning solutions are also available by Crest for maximum ultrasonic cleaning results. Timer, heater, power control and degas. All stainless steel enclosures resist chemical spills and will not crack. All timers have continuous operation. Inside Tank Dimensions L x W X H inches millimeters. Overall Dimensions L x W X H inches millimeters. 11.75 x 6 x 6 297 x 148 x 150. 12.75 x 7 x 11.625 325 x 176 x 295. 0.5 Gallon/1.75 Liter. 6" x 5.25" x 4 / 152mm x 134mm x 100mm. 0.75 Gallon/2.8 Liter. 9.5" x 5.25" x 4 / 242mm x 134mm x 100mm. 9.5" x 5.25" x 6 / 242mm x 134mm x 152mm. 1.5 Gallon/5.5 Liter. 11.75" x 6" x 6 / 297mm x 152mm x 152mm. 19" x 5.25" x 6 / 495mm x 134mm x 150mm. 5.25 Gallon/19.6 Liter. 19.5" x 11.75" x 6 / 495mm x 297mm x 150mm. 19.5" x 11.75" x 8 / 495mm x 297mm x 200mm. The item "Crest 1.5Gal Digital Ultrasonic Cleaner withTimer+Heat+Degas+COVER+BASKET, CP500D" is in sale since Thursday, August 07, 2014. This item is in the category "Business & Industrial\Healthcare, Lab & Life Science\Lab Equipment\Cleaning Equipment".